Hi,I am weiwei,from China. I use the translation tool to express what i mean. hope you can understand what i mean. I’ll appreciate that If you teach me how to express it correctly. 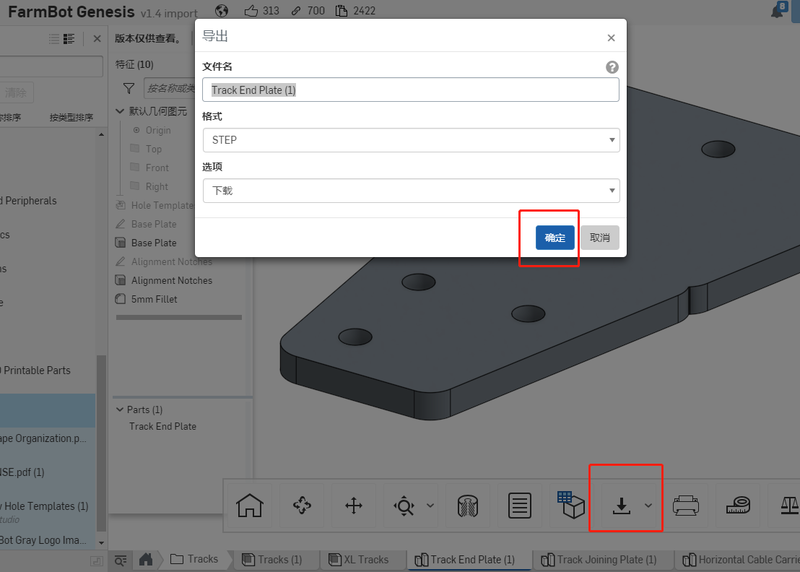 I successfully downloaded all 3D printable parts files from OnShape.com, but I failed to download Track End Plate file. Nothing to happen when I click the OK button. I use the Chrome browser. Weiwei, can you try downloading the file into a different format. Instead of STEP try a different file type like IGES or another type. thank you for your reply! I have tried it in my impression.I’ll try it again. should i use another Browser?like firefox? I tried every format i can, still failed. I tried to use firefox Browse,and also failed. Could you please send the files(all aluminum parts) to my emailbox ( 29613025@qq.com )? Here are the parts. For the future, also try to “Make a Copy” or create an additional copy of the assembly and then export the parts. In the future if that dosn’t work OnShape offers a free trial for the professional version for 15 days. Using the professional version may allow for additional export capabilities. I tried it out “Make a Copy” you said, and it worked.